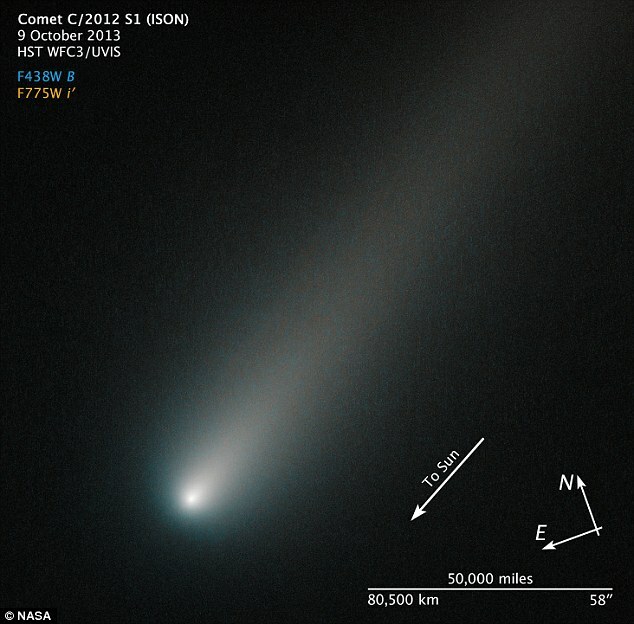 A comet which could become the brightest for a century is racing into our solar system, to the delight of astronomers. 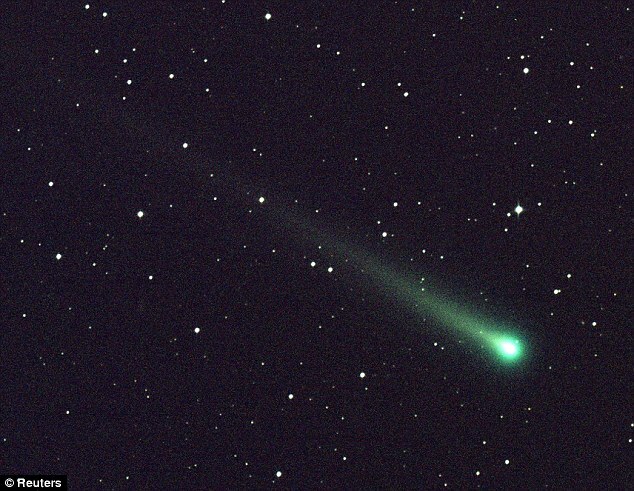 Comet ISON will pass exceptionally close to the sun in just under a fortnight, creating a spellbinding cosmic spectacle as ice in its body vapourises and forms a distinct bright tail. At least, it will if the heat does not blast the comet to smithereens – which scientists warn is not out of the question. The comet was discovered in September last year by two amateur astronomers using Russia’s International Scientific Optical Network, ISON, who marvelled at how bright it was even beyond Jupiter’s orbit. On November 28 it will pass just 621,000 miles from the sun’s surface – 150 times closer to our star than we are. 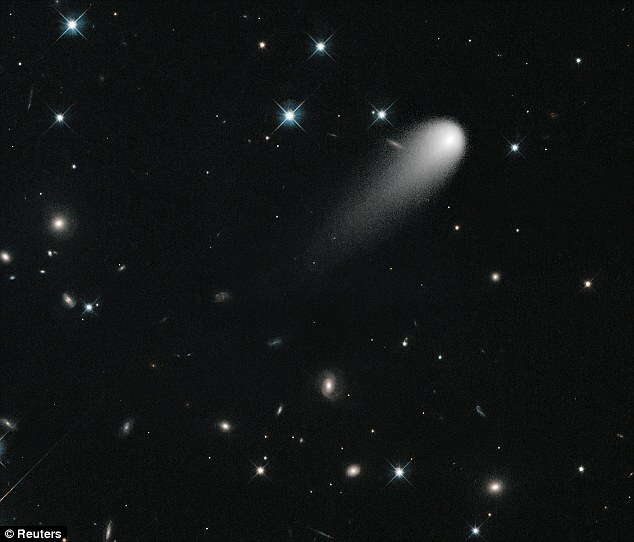 It will be more than 100 times closer to the sun than the Hale-Bopp comet, one of the brightest of the last century which was visible with the naked eye for a record 18 months in 1997. As it blasts towards the sun, the intense gravitational pull will make it speed up to 234 miles per second. The sun’s rays will also heat the ball of ice, metal and rock to 2,760 degrees Celsius, making it much brighter than most comets – with some scientists claiming it could outshine the moon. Some have warned that the intense pressure on the comet could simply blast it apart, as the heat melts not just the ice but also rock and metal. However, recent calculations have shown ISON is more likely than not to survive. Over the weekend, amateur astronomers began posting the first pictures of the comet on the Internet that were taken with just binoculars or small telescopes. It is expected to be visible to the naked eye in early mornings throughout December and during the night in January. Comets are believed to be frozen remains left over from the formation of the solar system four and a half billion years ago. ISON, which has never visited our solar system before, has emerged from the Oort Cloud, a reservoir of icy bodies beyond Neptune’s orbit. These balls of ice are occasionally ‘bumped’ by the sun’s gravity out of the cloud and into a flight path that brings them into the inner solar system. 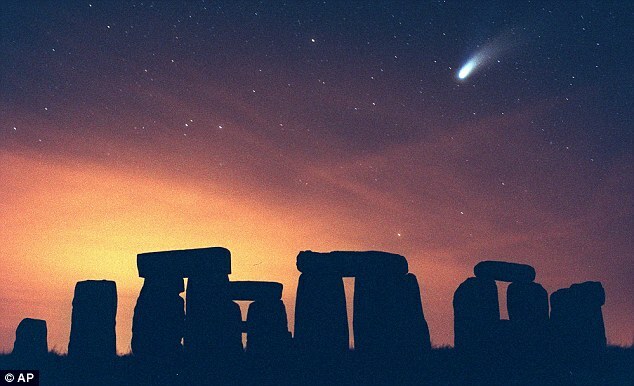 The vast majority of comets are invisible to the naked eye, but the most famous is Halley’s Comet. That is because it is the only comet which visits often enough and shines brightly enough to be seen by most people in their lifetime.